I got a chance to take my new Canon Speedlite 600EX-RT’s on a shoot. 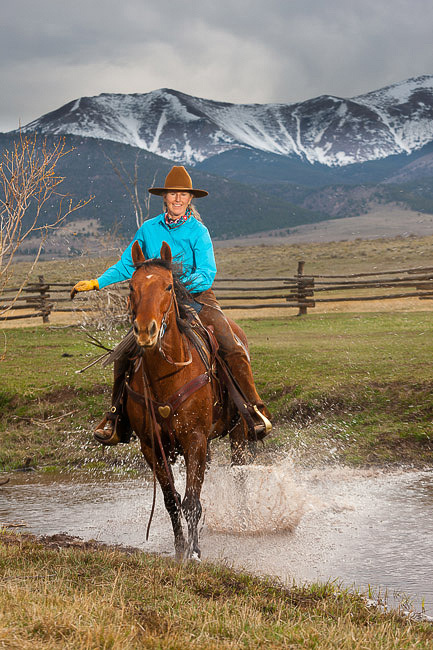 The location was Music Meadows Ranch near Westcliffe, Colorado. I was there to create some images to promote a new workshop I am teaching this fall. The workshop is “Western Landscape and Action” and hosted by Twin Compass (www.twincompass.com). I bought the last two 600EX-RT’s that Samy’s Camera had at the Palm Springs Photo Festival earlier this April. After a 10 minute lesson from a Canon rep at PSPF I found the menu buttons more intuitive than the 580EX-II’s I have been using. I was still feeling the pain of sticker shock from this purchase a week later. These units are expensive and the system is not worth investing in unless you have at least 2 units. Even with a minimalist system of one 600EX-RT and one ST-E3 you are out $950-$1,000. The pain quickly faded when we put them to use and after two shoots they have performed very well with ease. I have not been able to get a ST-E3 transmitter that works with the radio wireless system with these new speedlites yet. So for now I have to use one unit as a transmitter limiting my lighting options to very simple, one light, off-camera set ups. Here’s what I really like about them: It takes less time to get operational on wireless radio mode than it does attaching Radio Poppers to the older 580 series speedlites. The Radio Poppers have been a savior for me the past few years giving me what I needed: a wireless flash system that works in any light and behind walls, trees, etc. 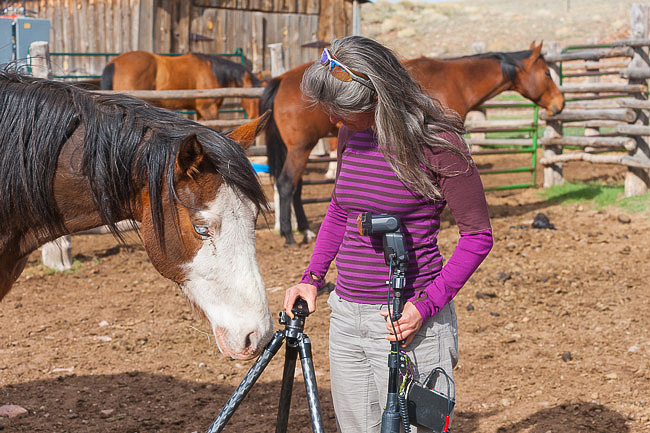 The 600’s simplify and streamline the wireless speedlite workflow. This is a great asset under high pressure situations like some assignments and fast breaking photo ops where a speedlite is needed. No more carrying different size batteries or working with mounting brackets that often break and having to turn on two electronic units. Upon turning the power on the two 600EX units and pushing 4 or 5 menu buttons we were up and running in wireless RT mode using the “Auto” channel mode in about 10 seconds. Being able to zoom to 200mm is long overdue. Zooming in to 200mm gives a little more “horsepower” using high speed sync, which I do often, and being better able to focus the light on a subject in a wide angle scene without needing a light robbing grid. There are a few things I don’t like. First, they are bigger and don’t really recycle any faster than the 580-IIs. Second, the new radio system does not work with the 580-IIs with Radio Poppers attached. At over $600 each I think they are priced too high and again you really need at least two if you are going to use the wireless RT system. What is most disturbing is the manual claims these units can’t be used in wireless radio transmission mode with cameras older than 2012 models. (Nothing like Canon trying to sell new product at every turn.) However, on my Canon 1D Mark IV and 1Ds Mark III they worked fine in TTL and synched at all speeds. No need to rush out and get a 1Dx or 5D Mark III to use these new units in wireless radio transmission mode. As usual when working with animals we first did a familiarization tour letting the “subjects” see and sniff all this fancy new stuff. They quickly ignored the lights when we began shooting for real. In the horse crashing through the creek scenario, our light was flat with thick clouds over the Sangre de Cristo. Employing the speedlite enabled me to punch up the colors on Elin, the rider, and Rocky, the horse, while maintaining some rich detail in the background. Lauri was about 30 feet away from me with the strobe on a tall boom to place it just under Elin’s hat brim. Elin and Rocky riding through a creek at Music Meadows Ranch in Colorado. Scene is lit with the 600EX-RT in radio slave mode with the light on a boom about 8 feet high slightly to camera left. At sunrise the next morning with Elin and Rocky riding in a patch of spring green grass the sun was absent on them but lighting the background mountains. I had Lauri about 75 feet in front of me so I could get a telephoto perspective. The units worked fine at that distance. 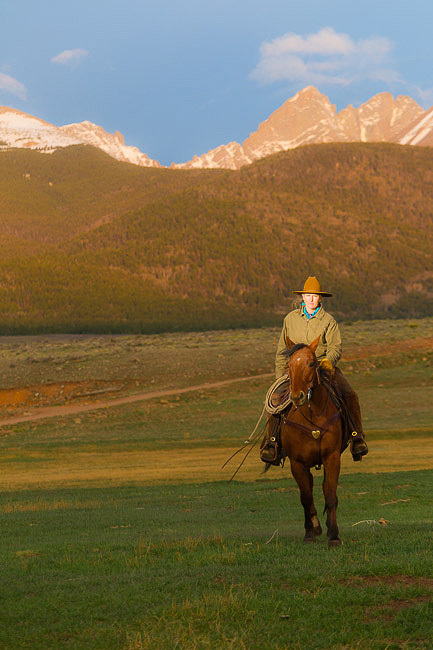 Elin, owner of Music Meadows Ranch in Colorado riding Rocky as the first rays of light hit the Sangre de Cristo. The sun was not up yet where Elin is riding so she is lit with a 600EX-RT on radio slave mode. Camera to subject distance is about 200 feet and shot with a 70-200 zoom. The flash to subject distance is about 20-30 feet. 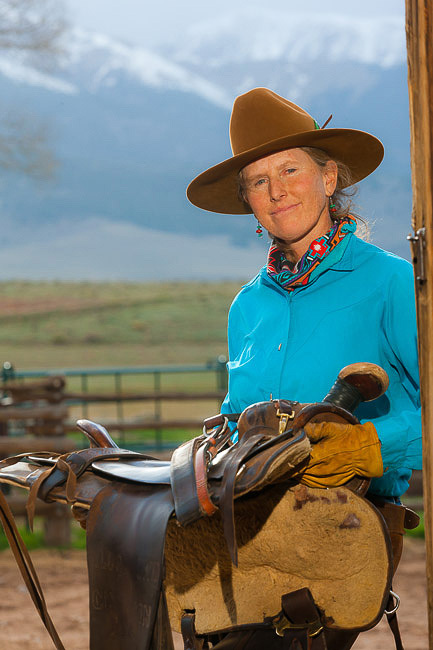 For the saddle portrait, the slave speedlite had no problem firing through the wood walls of the barn. Thank you, Michael. The rest of us can only aspire to do half as well. The first picture with the horses spread out in front of you, is spectacular! I appreciate your compliments Robert. Truth be told, I only use speedlites when I need to make a better image. Most of my photography is with only ambient light like the horses coming at camera. I was really jazzed to get that shot since. It was something I previsualized it and it took some effort for me to communicate with the wrangler to describe what I was looking for and for her to get the herd where I wanted them. After about 10 tries we got it!